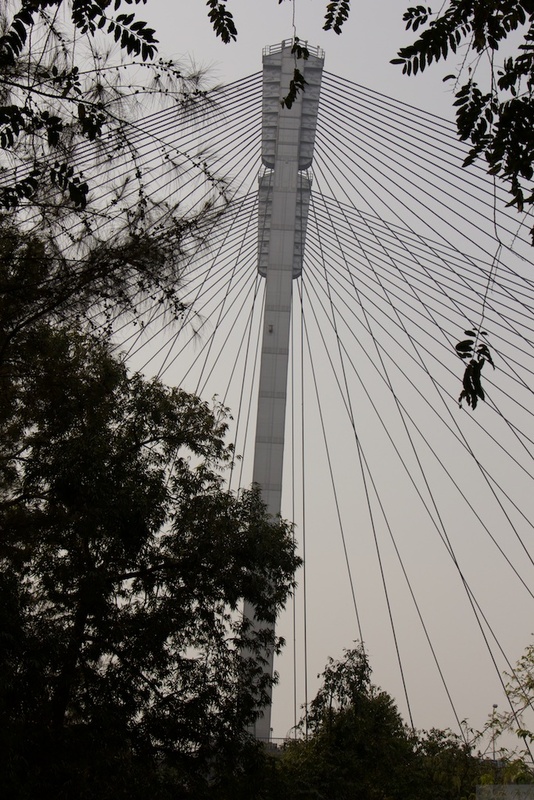 I had a great day, photo-walking in Kolkata on the last day of my trip. 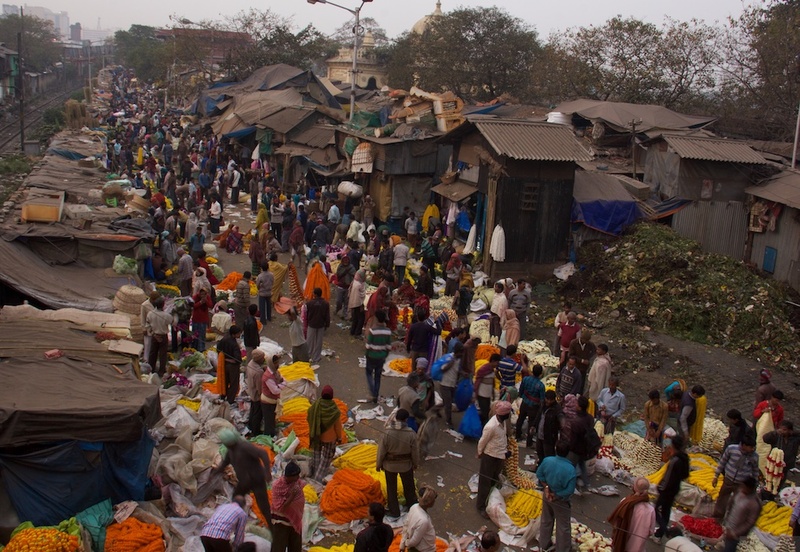 On the advice of some local photographers, I set off at sunrise to the Flower Market just below the Howrah Bridge. While flowers never fail to excite me, the Howrah Bridge (officially “Rabindra Setu”) is actually the iconic structure in the city, and a pretty impressive one at that. I walked the span of the bridge and back – there’s a comfortable pedestrian walk way on both sides, and offers interesting sights of the river Hoogly. I imagine it gets busy and crowded later in the day, but an early morning walk is a pleasure. 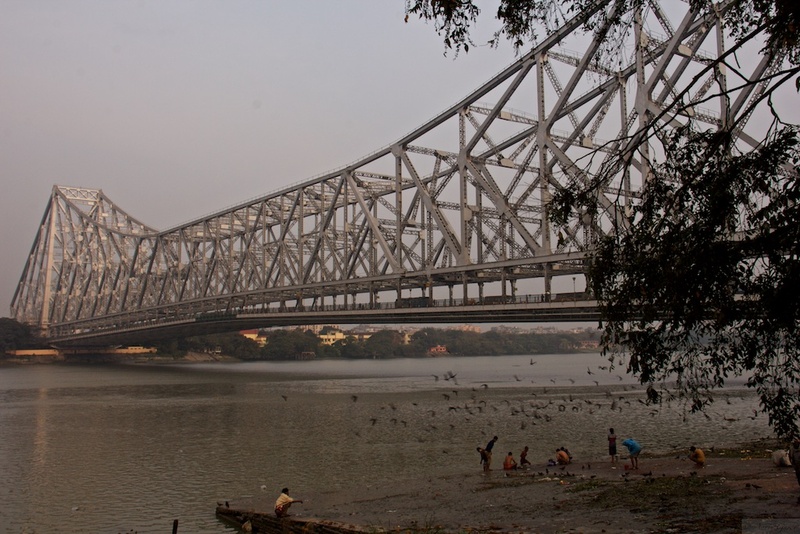 At one end of the bridge is Howrah railway station, and at the other, the flower market. Kii Sundor! Marigold season – all those unbelievable snake-like garlands of orange & yellow, dahlias so large that I thought they were fake, roses, chrysanthemums, and the people! I wasn’t the only person doing a photo walk here, I met at least 3-4 other people with the same idea. Some folks friendlier than others, some curiosity about why were they the subjects, some fairly mucky sections to walk through – oh! I was in travel-heaven! 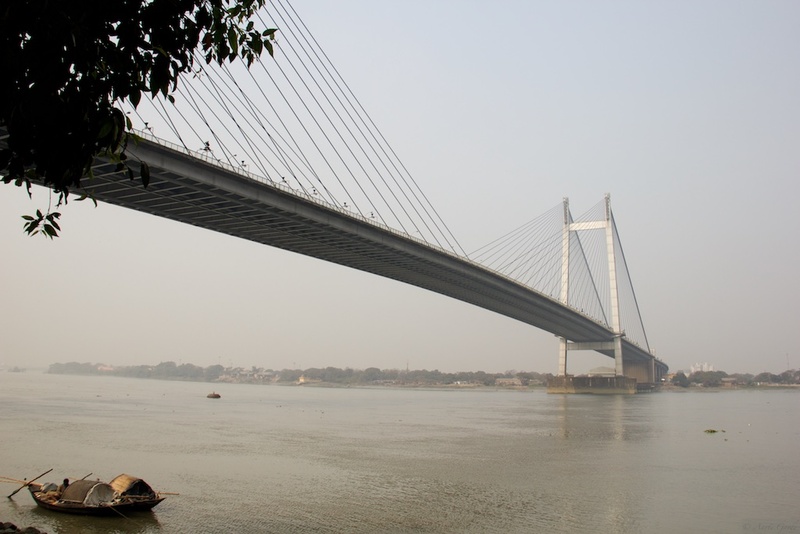 Having had plenty of glimpses of Kolkata street life, I was not entirely satisfied by the flower market alone, and set off walking towards the other iconic bridge down the river – Vidyasagar Setu. On the walk I was treated to the sights of the city stirring to life, and some views of the river. There’s a section of the path that has been beautified for walking, just before the Princep Ghat. It’s a great spot for photos of the suspension bridge. 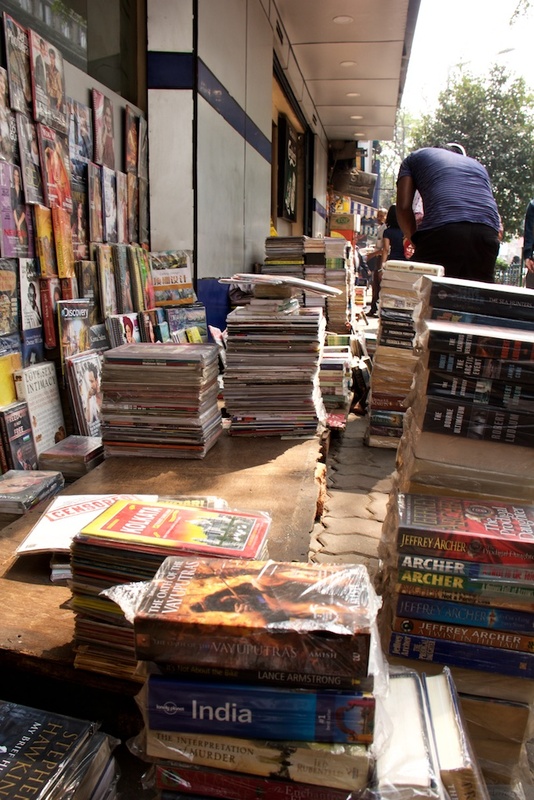 By the time I got to the Princep Ghat Gardens, the day had truly well begun, and the city was up and about. And I was hungry. Which meant the end of walking. So into a cab I hopped, straight off to Park Street. Bought a book and found a table at Flury’s, being in the mood to tick off all the checkboxes. I really like your pictures, especially the way you capture the portraits of the Indian people. Thanks so much for sharing! You surely had a great time on the last day. Awesome pictures.